Boston sure as hell didn't have a restaurant such as this. Late afternoon yesterday, I caught up with yet another old friend @ VYNL in Hell's Kitchen. What a visual treat. I had to take notes like a nerd on my phone when I was at the restaurant because there was just way too much fun stuff going on. Let me just get it out of the way before I go on about the decor of the restaurant - the food was good. Now the fun stuff: First of all, I love how they spell the restaurant's name. All the tables are made of mosaic tiles. One of them was sweet n' low. How cute. 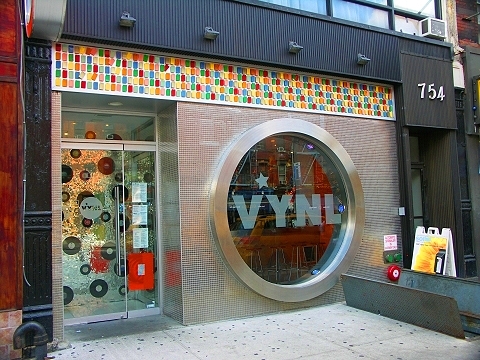 VYNL has 4 themed bathrooms. I only used 3 of the 4 but the ones I used were Nelly (the rapper), Dolly (Parton) & Elvis. There is a huge wall of mosaic tiles creating each of their pictures and little barbie dolls inside of them. Apparently, their respective music play in the stalls as well. I got a serious kick out of the restrooms and I usually HATE restrooms. There is a very Grease-y feeling to this restaurant. Like very old school with a hint of gay pride elements. Very colorful. Silver stars hanging from the ceilings. 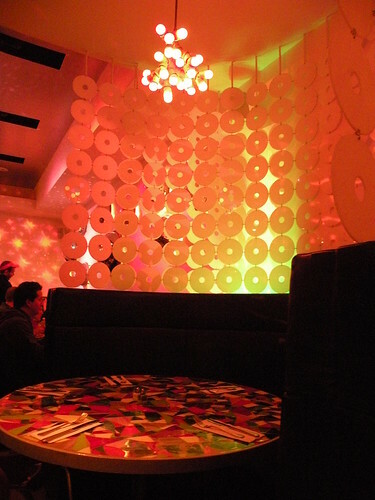 White discs acted as wallpaper. Last but definitely not least, a huge disco ball in the center of the restaurant. Just too much but it was fun lol. VYNL's soundtrack also included some of my favorite artists such as Fiona Apple, Bjork, Radiohead etc.